In this day and age, it’s difficult to produce any sort of “building” toy without invariably being compared to LEGOs. When I was growing up, it all boiled down to LEGOs and K’nex, with each offering a radically different take on the concept. There was, however, another kind of toy that was starkly different: robotic building toys. While there weren’t many companies that offered robotic building toys, the few that did were quite ambitious for their time. I actually took a summer class at the local community college as a young child where we utilized such a set to build robots to fight one another. While the concept was nearly unknown, and the capabilities were very limited, it was a very interesting experience. So now, in 2014, robotic building toys are starting to gain momentum. With the rise of the Information Age, the capabilities of what we can do with computers and AI have given rise to an increasing interest in science and robotics. More and more robotic building toys have arisen as a result, catering to those preferring to create their own robots, rather than just controlling them. Enter MOSS, a series of Modular Robotic Building Toys from aptly-named creator Modular Robotics, developer of the popular “Cubelets” Robotics Construction Set, and which devotes itself wholly to this kind of toy. MOSS was made possible thanks to a successful Kickstarter campaign in late 2013, which raised over three times it’s intended goal. The core behind MOSS is to create semi-intelligent robotic building toys capable of a variety of functions, while remaining simple and user friendly in their response. While more complex robotics exist, such as LEGO’s own Mindstorms series, MOSS fills a much simpler role of being a toy you can simply pick up and build with, with zero need for external software (save for a free Smart Device app to control the Bluetooth module) or any sort of programming knowledge. MOSS comes with a variety of modules, ranging from spinners that can have wheels attached, sensors for light, motion or sound, joints and more, allowing for the creation of a wide range of unique and interesting robots. The main thing that sets MOSS apart is in its construction form. Where most robotics rely on interlocking plastic, MOSS connection is entirely magnetic. Each block is edged with magnetized indents that can have a magnetic ball placed in them, and then attached to another block. This is the fundamental function that makes MOSS so easy to build with. Two balls on the edge of one cube attached to another cube, and you have a working hinge. Four balls, and two blocks will fasten comfortably together. Never is there any confusion as to how “what-connects-to-what,” as everything connects to everything else in the exact same way. This makes MOSS easy to pick up and build with, without ever feeling like it is too complex. Kids who are into building, robotics or have an interest in any sort of Engineering. Engineers, especially those in a mechanical field. 8 and up. MOSS consists almost entirely of small parts, with the small magnetic balls in particular being a potential choking hazard. The biggest flaw behind MOSS is ultimately a result of the very thing that makes it so good. Because the whole of a creation is held together by magnetic balls, this makes them somewhat fragile by design. Should your creation suffer a crash, or an unfortunate roll off some small drop, some re-assembly will probably be necessary. MOSS Robotic Building Toys cost $149.95 for the 14-module Basic Kit (Zombonitron 1600), and $479.95 for the Advanced Builder Kit (Exofabulotronixx 5200). At the time of this review, the Advanced Builder Kit was listed on Amazon.com for slightly more, so pricing may vary depending on availability. No information regarding guaranteesis available. As with any form of robotic building toy, MOSS Robots are expensive. However, that does not dissuade you, they will be well worth the investment. 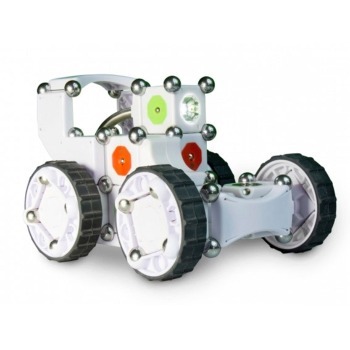 Robotics building toys are still few and far between, and MOSS offers a fantastic entry into the field. MOSS Robotics can be purchased directly from Modular Robotics website or online retailers such as Amazon. They may also be available in your local toy outlet, but I would recommend checking for availability over the phone or internet before going out of your way. Great idea, solid product. If you or someone you love is a fan of electronics or robotic building toys, MOSS will certainly provide many hours of enjoyment.